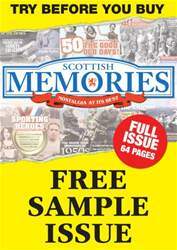 Get your FREE Sample issue of Scottish Memories today! (2 Customer Reviews) | Write Review 12 issues per year Scottish Memories is a monthly magazine which takes a nostalgic look at Scotland’s past. Fascinating features recall the fashions, events and people of yesteryear, while members of the growing reader community share their own memories in the hugely popular 'Scotland Remembered' pages. Every month our loyal readers return to the magazine to sample beautiful photography showcasing the country’s stunning scenery, catch up on the latest news and events, discover another corner of Scotland in the comprehensive Destination travel guide, and interact with fellow readers. 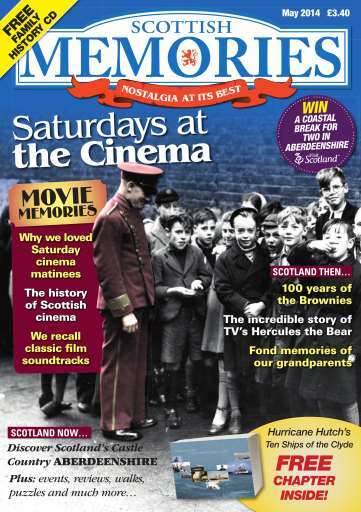 Scottish Memories is a monthly magazine which takes a nostalgic look at Scotland’s past. 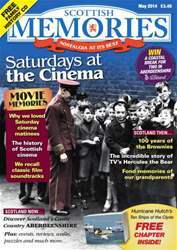 Fascinating features recall the fashions, events and people of yesteryear, while members of the growing reader community share their own memories in the hugely popular 'Scotland Remembered' pages. You'll receive 12 issues during a 1 year Scottish Memories magazine subscription. This is a great read for someone who grew up in Scotland, lots of nostalgic articles, images as well as some lovely landscape scenes of Scotalnd. Great. Living in Australia I have had so much pleasure reading the Scottish Memories magazine..........particularly the Christmas/New Year issues. Brings back memories of the best years of my life. You'll receive 12 issues during a 1 year Scottish Memories magazine print subscription.